Nowadays , many people are using torrent clients to download their favorite music programs ,TV shows and movies . The difficult task is to find out the torrent for each TV show , after it had been aired . One’s we find out the correct torrent , it is very easy to start download with any torrent client . 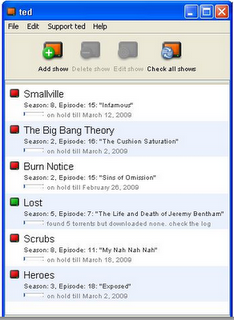 So here is a software that can search multiple forums and search engines for suitable torrent and download them automatically after each episode . 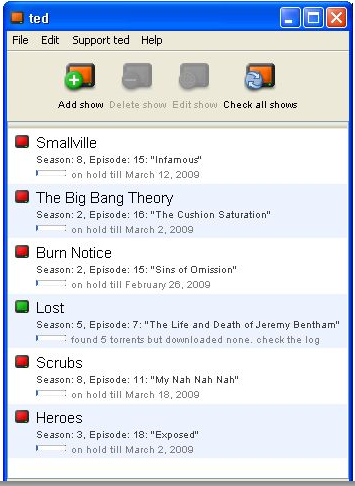 Download TED ,Torrent Episode Downloader and add your favorite music shows and TV episodes to the menu list .They will search TV.com for the details of those entered TV show episodes and find out the exact date and air time . After the show time ,TED will start looking forums and torrent search engines automatically and finds out a suitable torrent . The torrent will be then sent to the default torrent client on the system . Torrent Episode Downloader is a free program and it saves a lot of your spare time .